Researchers at Purdue University and the National Renewable Energy Laboratory have shown that a new crystalline material has the capacity to double the efficiency of solar cells, producing solar panels that are theoretically ‘two thirds’ efficient – instead of the current one-third efficiency available from the mainstream, silicon-inspired solar cells. Their goal is to catch ‘hot electrons’ with this hybrid-perovskite material. Solar power research has shown that there is significant space for efficiency gains that will lower pricing even further than has already happened. If you read our Electrek Green Energy Brief (9 AM M-F) you’ll see constant updates from the industry showing a pathway from today’s standard 16% efficiency through a potential 26% efficiency with silicon only. Right now, we’re seeing PERC hardware upgrades across the industry. PERC, without any further research – just implementation and significant capital upgrades, seems to give a clear path to a 22% efficiency. If the whole of the solar industry can upgrade from a 16-17% average to a 22% average – the price per watt will fall 30% further – and that’s before we start considering next generation research from universities like Purdue. At Purdue, the material, a crystalline structure that contains both inorganic materials (iodine and lead) and an organic material (methyl-ammonium), will boost the efficiency of solar panels by conducting (without loss), at least two-thirds of the energy trapped from sunlight without losing more than a third to heat via Shockley-Queisser Limit. Unfortunately, incoming electrons can have more energy (for a very short time) than the system can handle (we’re talking about a topic called band gaps right now). These electrons are referred to as “hot carriers,” and in silicon they exist for only one picosecond, traveling a maximum distance of 10 nanometers. 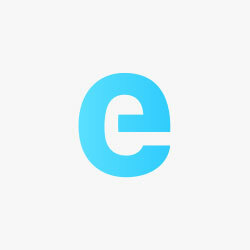 It is at this point in the energy conversion process that the hot carrier electrons give up their energy as heat. This is one of the main reasons for the inefficiency of mainstream solar cells, inspired by silicon. “The next step is to find or develop suitable contact materials or structures with proper energy levels to extract these hot carriers to generate power in the external circuit, this may not be easy.” And during that time they’ll also have to figure out how to replace lead. And get the perovskite to last for decades instead of days and months. Research like this is not what is driving solar panel efficiencies today – that research started long ago – the above research is for tomorrow’s benefit. 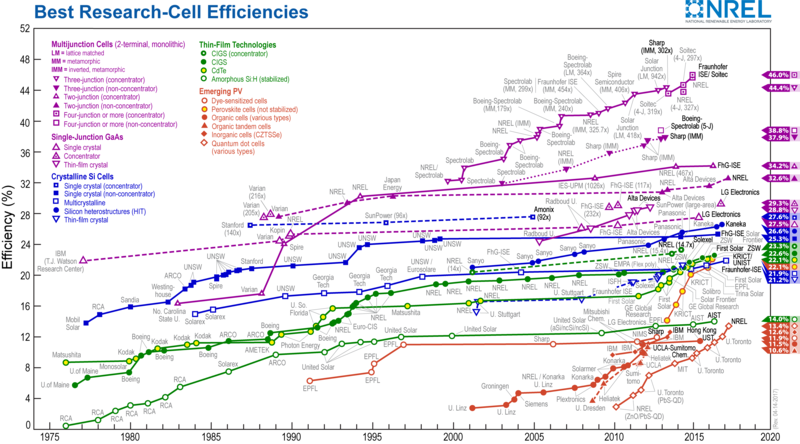 NREL’s solar cell efficiency chart – below – shows many different solar power technologies as they’ve increased over time. The blue range is where most solar cells you and I see exist. Though a wonder material may suddenly arise, like perovsite seems to be in the media these days, reality is that most of this research takes a long time to commercialize. PERC solar cell research started in the 1980s – its been rolling out recently. I’m just learning about it as I write for this website over the last six months. Perovskite probably won’t have a significant effect on the market for more than a decade. That 26.3% heterjunction cell made in Japan or anything that the Fraunhofer researchers are publishing today – might have an effect in the same time frame (though the Fraunhofer people are doing research at all levels – including directly with the manufacturers of solar panel manufacturing lines). And its the reasons above that I am only looking at solar cells increasing from today’s average to today’s peak values – because those are realistic to see in the marketplace. Many projects with ultra premium SunPower have been installed under my watch. Last week, I submitted another quote with a 19%+ LG Neon solar panel that is close in performance to SunPower, but a lot cheaper – and I think its going to close. That customer will get 18% more watts in the same area – at a price ~$0.50/W cheaper than SunPower, but ~$0.20/W more than the standard 16% product. Of course, it isn’t a cake walk yet. With companies like Yingli fighting for their existence in the 16% space and losing money, there are going to be plenty who push toward the higher margin, lower volume middle efficiency space like SolarWorld or LG. In fact, it seems SolarWorld made it official to only compete in this higher efficiency range (we’ll see if they can hold on). An increase in efficiency – meaning more revenue for the same solar panel – could be a path if component costs can be held in check. If those component costs can’t be held in check – then these groups won’t be able to stay in the ‘solar technology buy cycle’ some proclaim we’re in. And if this efficiency path can come to be – it gives everyone in the supply chain a chance to breath, make a little bit of profit and expand further. One way this path can occur if the price per watt falls slower than the efficiency increases. In 2016, I started buying solar panels in the 305-310 range regularly, by the end of the year we were closer to 330-335W panels. These were the 15-16% panels making an efficiency move to 16-17% – ~6% effective efficiency increase within a single business year. Yes, our pricing per watt fell much further – but our volume per rooftop increased. And total job volume relative to fixed costs matter. Interestingly, as panel efficiency grows – there will be downward pressure on job growth per volume installed. This I am sure will be balanced out by general installation volume growth. There is a clear path for significant further price falls for solar power installations for the next five years. That price – for whole systems – could be as much as 35% from panel efficiency alone. Of course, waiting for those panels means you miss the healthy incentives and positive net metering laws of today.